WALTHAM – HBI’s two-day launch of the Project on Latin American Jewish & Gender Studies (LAJGS) began with a dramatic reading of Marjorie Agosín’s Anne: An Imagining of the Life of Anne Frank at the JCC of Greater Boston and followed the next day with programs in two Jewish day schools. “The events highlighted the ongoing relevance of Anne Frank in Latin America “as a reminder of the enduring power of art, narrative, and truth as resistance to systemic instances of dehumanization,” said Dalia Wassner, director of the LAJGS, a project with the mission to study and explore of Jewish life and gender in Latin America and among Latin American Jews worldwide. In her opening remarks, HBI Director Lisa Fishbayn Joffe noted that in a week that saw the anti-semitic slaughter of 11 Jews at the Tree of Life Synagogue in Pittsburgh on a Shabbat devoted to welcoming the stranger and refugee in our midst, we are reminded “that we must be ever vigilant to identify and respond to those who would demonize some groups in society, who would divide us and who would facilitate anti-semitic violence against us.” In the re-telling of the story of Anne Frank for children, Marjorie Agosín and Francisca Yáñez, offered guidance and insight into addressing this complex and delicate task of explaining terror and violence to children, Joffe noted. The evening opened with a performance by Nisha Sajnani, director of Drama Therapy at NYU, accompanied on piano by Jan Zimmerman. Artwork from Argentine artist Sandra Mayo displayed on stage and on the way into the auditorium complemented the themes of the evening by connecting the Holocaust and periods of dictatorship in the Southern Cone. The program as a whole urged the audience to consider the ongoing impact and salience of Anne Frank in Latin America. 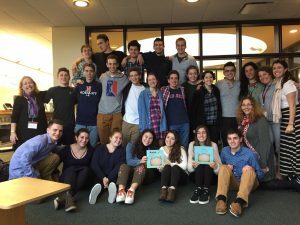 The launch of the LAJGS project was made possible by a gift of $50,000 to HBI from former HBI director, Professor Emerita Shulamit Reinharz and former Brandeis President Jehuda Reinharz. Shulamit Reinharz explained that the focus of their philanthropy is to fund projects that embody an important innovation on issues related to Jewish life and social justice and are led by a dynamic individual. The LAJGS project, led by Wassner, is a “perfect fit for these goals,” said Shulamit Reinharz. The following day, Nov. 2, Wassner, Agosín and Yáñez held workshops at Gann Academy and Solomon Schechter Day School. Yáñez spoke to Lily Rabinoff-Goldman’s creative writing class at Gann. She told the students that her country had suffered a coup d’etat in 1973 that ousted the democratically elected Salvador Allende, instituting instead a military dictatorship under General Augusto Pinochet that would last 17 years. She recalled the feelings of insecurity and fear she felt as a little girl who became a refugee. In preparation for their departure, her parents asked her to pack her most beloved belongings. She recalled choosing a favorite doll, but mostly paper cutouts of beautiful color images. As she boarded the plane, her suitcase flew open causing her paper cutouts to blow away. At that moment, her family was being escorted at gunpoint, allowed to escape only due to a moment of international cooperation. Certain her cutouts would be lost, Yáñez told of her surprise when her father, mother, and brother each turned and descended the plane’s stairs, set on retrieving the youngest family member’s prized possessions. At that moment, she understood what love looked like. Wassner thanked the event’s co-sponsors, JCC of Greater Boston, Facing History & Ourselves, Gann Academy, Hadassah Boston, Jewish Women’s Archive and Temple Beth Zion of Brookline. Earlier in the week, Yáñez spoke in Agosín’s class at Wellesley and also at Emerson College. To learn more about the LAJGS and other upcoming HBI programs and events, visit this web page. Editor’s note: Join us at Brandeis University on Thursday, Jan. 18, 2018 at 7 p.m. for Graphic Content: The Sacred Art and Beautiful Math of Rachel Braun, Liberman-Miller Lecture Hall, Epstein Bldg. 515 South St., Waltham. This article first appeared in Lilith’s online blog. God Counts the Stars, 2015, Rachel Braun. Embroidery has been part of my life for over two decades; it is a core Jewish practice for me and an entry point into sacred texts. I design Judaic embroidery, starting with words from Torah or liturgy, then elucidating and interpreting the words with needle and thread. But before I discovered my embroidery passion, I’d thought about needlecraft only in limited ways. In college, some 40 years ago, I read an article about Colonial quilt-making for an anthropology class. The author wondered why Colonial women would commit to such a painstakingly slow production process. Indeed, needlecraft is very laborious! Designing and stitching an embroidery canvas can take me easily 150 hours. The author’s hypothesis was that usually women were responsible for repetitive production processes which had temporary outcomes, living under a tyranny of iterative tasks. Women cooked and fed their families; hunger returned anew. We laundered clothing; those garments became soiled. We cleaned; dirt arose again in every corner. Quilting, the author concluded, allowed women to participate in permanent material culture, establishing and recording their presence. Perhaps not as physical as barn-raising (and not as well paid? ), but still valued. In my adult life, I’ve become aware of the impermanence of traditional female tasks, though my responses to the feeding-laundering-cleaning conundrums of Colonial women may have differed. Raising four children, I cycled through three basic lentil recipes at dinner and taught my kids to use the washing machine. As for cleaning, my mantra became “as long as the kids don’t get cholera, the house is clean enough.” They didn’t, and it was. But I do embroider—vigorously, creatively, spiritually. Am I, as was alleged for our Colonial quilters, seeking immortality in material culture? That premise seems a bit specious: what we call women’s work (and what that treatise I read in college alleged was impermanent) is indeed permanent work: a long-term investment in the continuity and culture of humanity, as stabilizing as building a barn. But material culture has its purpose—useful, beautiful, necessary, communal. My framed embroidery pieces adorn the walls of my home and shul, and I dream that one day they will be passed to future descendants, or even considered museum-worthy. Just in case they aren’t, I’ve made a dive at immortality by sharing them in a book, Embroidery and Sacred Text (2017). In contrast, the process of designing and creating the embroidery is not about seeking permanence. For me, it has become a potent practice of living Torah and enacting Jewish life, rather than documenting myself for future generations. These experiences unfold in the offering of a drasha, a textual commentary, within the design itself, and indeed, in the repetitive glide of the needle through the fabric. Jewish life is built around repetition, as can be attested by anyone who has slogged through a Torah reading about details of Sanctuary construction or particulars of sacrificial offerings. The former, including the lampstand of the Sanctuary, was a permanent aspect of Israelite material culture. In contrast, we who have fallen in love with our babies’ peculiar little scents fully appreciate that the fleeting sweet savors of the sacrifices might have ingratiated an ancient Israelite with the Deity. Perhaps it’s the statistician in me that is so attracted to these “boring,” repetitive verses. The verse that is worked into “Lampstand,” pictured above (2016) includes this construction detail: “a knob beneath two stems, from it, a knob beneath two stems, from it, and a knob beneath two stems, from it, for the six stems that issue from the Lampstand” (Exodus 25:35, translation by Everett Fox). Hearing that verse of Torah read aloud, emphatically, made me want to embroider the knobs, all the more emphatically. Another favorite text is the list of Israelite stops in the wilderness of Sinai. The Book of Numbers, Chapter 33, lists 42 stops made by the Israelites as they progressed to Jericho, before entering the Promised Land. Remarkably, each stop is listed twice: “They set out from Hazeroth and encamped at Rithmah. They set out from Rithmah and encamped at Rimmon-perez. They set out from Rimmon-perez and encamped at…” (JPS). Moved by the rhythm of those repetitions, I embroidered the place names around the border of “Bamidbar: In the Wilderness” (2011). Bamidbar: in the Wilderness, 2011, Rachel Braun. Was the repetition of names and verbs describing their travels—setting out and encamping—insistence that the Israelite journeys could not easily be distilled? Surely, in God’s recurring acts of protection and anger; in Moses’ stream of reflection, rebuke, and encouragement; and in the Israelites’ stirrings of joy, desperation, and disappointment, there was much insistence and less mere repetition. I used the embroidery patterns of “Bamidbar” to develop that drasha in thread. Each pattern block (so-called blackwork embroidery) varies in geometric symmetry: a mixture of reflections, translations, and rotations. The placement of patterns and colors gives the piece, overall, an essential 180° rotational symmetry. The intention is to convey movement, unevenness, and variations of order and disarray– much like the biblical journeys described in Numbers. If part of the human task is to seek the Divine by emulating God’s behaviors, we embroiderers are in a good place. The embroidery “God Counts the Stars” (2015), pictured at the top of this article, quotes Psalm 147:4-5: “God counts the stars, giving each a name; with grandeur and power, wisdom beyond measure” (my translation). God counts the stars! That God painstakingly conducts a celestial census, and in doing so honors individuality in each, certainly touches a statistician’s heart. What patience that takes! What concentration, and attention to detail! Just like stitching—patient, intentional, repetitive, faithful. And just as God names the stars, the embroidery gives each star its own needlework pattern. The art interprets the text, but it also mimics the text, and exposes the text. The anthropologist was wrong. Repetition and renewal are not circumstances to be requited with permanence. Rather, they pulsate with the rhythm of life, honoring the endurance of its fragility and the individuality of seemingly identical elements, be they meals of a Colonial household, knobs of the Sanctuary lampstand, or stars in the sky. Repetition is everywhere in Jewish life: in sacred text, in the cyclical reading of Torah, in counting stars, in the geometric patterns of blackwork design, in the embroiderer’s steady hand on the fabric, in Jews’ never-ending celebration of words. With each repetition, we insist that we will seek and savor that which is sacred. * I am indebted to Lisa Newell z”l for introducing me to Stein’s ideas. Addressing a Fabrangen Havurah High Holiday service long ago in Washington, D.C., Lisa wondered aloud why we had so many Amidahs to recite and to repeat. Paraphrasing Gertrude Stein, Lisa explained, “Repetition is insistence!” Among her many accomplishments, Lisa was co-counsel in the 1983 landmark comparable-worth case, challenging women’s wages paid by the State of Washington. She died in 2000. Rachel Braun explores how Jewish texts can be embroidered—literally and figuratively—in original needlecraft designs. Braun is a Torah chanter, synagogue service leader, Jewish educator, and high school math and statistics teacher. Her talents—artistic, spiritual, and mathematical—come together in her book Embroidery and Sacred Text: New Designs in Jewish Needlework (Bookbaby, 2017). Her website is www.rachelbraun.net. So I limped through latency, with the shrewish carping of Sheyne Sheyndel ringing in my ears; I agonized about the foolish decisions made by her luftmensch (airhead) husband, Menachem Mendel. There was a patina of courtesy between them, but the geshrei (shrieking) of that woman– is it any wonder I developed tinnitus? Stories from the Tanach (Bible) tormented me, too. What kind of father even thinks about sacrificing his son? What kind of God knocks off whole cities (S’dom) and planets (Noach) and punishes until the tenth generation? Some guy named Shlumiel gets zapped for picking up sticks on the Sabbath—yikes! Adonijah hangs from a tree by his hair—who knew long hair was so dangerous? “Look, they’re just stories, El.” My dad tried to minimize the collateral damage of my Jewish education. But in the real world, there were worse stories, like my grandmother’s first person account of a pogrom she attended. Or that of my cousins in Israel, whose Holocaust tales made Halloween a mere stalk in the park by comparison. PLO and PFLP were just assortments of alphabet letters, until they became the menacing specters of my young adulthood auguring high panic mode. My college psych professor nailed it. “Signal anxiety,” he lectured, the deployment of emergency defenses in support of the ego. I sat bolt upright and faced the doctor. “I beg your pardon!! ?” My diagnosis pierced my consciousness. “But what?” Hope flickered faintly. “But . . . many patients find remission in revisiting the original symptom, in your case that Sholem Aleichem story you always talk about.” His two index fingers touched tip to tip, pointing toward me like a divining rod. Suddenly I knew what I must do. I must bring Sheyne Sheyndel and Menachem Mendel back to life and help them. I would feel better if I just made things right for these two struggling souls. And so I did. I wrote them into a novel of my own and gave them what Sholem Aleichem couldn’t: a happy life, a thriving family, riches and satisfactions beyond measure. Oh yeah, and I gave them some Prozac. I can’t emphasize how well I feel since doing this. So if you’re feeling PsychoSemitic, save yourself the angst and the Benjamins ($100 bills). Get to Amazon and buy my new novel. Read it. Think profoundly. Laugh liberally. This book may just tamp down those pesky—some say scorching– PsychoSemitic sparks. Dr. Mahmish now recommends it to all his patients as the most copacetic treatment yet for the most recalcitrant and unremitting PsychoSemitic symptoms…and it’s a great way to celebrate Jewish Book Month. Ellen Golub was born in Chelm, the illegitimate child of an itinerant wedding jester and Mela Tonen, a descendent of the Talmudic sage, Bruria. At three, Golub could recite the entire Torah by heart. At five, she became the first female student admitted to the Mir Yeshiva, and quickly became known as The Beyz Mir, a fierce proponent of the second Hebrew letter. After viewing the movie Yentl, Golub became convinced that life as a female Talmud scholar would be more rigorous than advertised. She abruptly left the Yeshiva world and fled to America where she went into treatment with Edward Hopper. Her analysis convinced her that if she really wanted a happy ending, she would have to become a fiction writer. So she lit out for the Apple store and never looked back. PsychoSemitic is Golub’s answer to the Jewish question. And yes, she is available for weddings, Bar Mitzvahs, and book groups. With 40 cubic feet of boxes containing 800 files ranging from AIDS to Zionism, the newly acquired Lilith Magazine Archives at the Robert D. Farber University Archives & Special Collections tells pathbreaking stories from the lives of Jewish women over the past four decades. Behind the stories are still other stories, all contained in these boxes. It is nothing less than the “concrete evidence of the changes that have taken place in 40 years — both in the women’s movement and in Jewish life. Lilith has both borne witness and spurred those changes along,” said Susan Weidman Schneider, ‘65, one of the founding mothers of Lilith. The stories within show how a magazine can form a “connective tissue” for women around the world and give voice to their issues. They show how a group of pioneering women journalists with little business experience started a nonprofit social-change-oriented periodical from scratch, learning as they went. “We hope many of these documents will be inspirational to other feminist start-ups,” Schneider said. They tell the story of a bygone era of journalism where manuscripts went back and forth in the “snail mail,” with handwritten comments in the margins, providing a window into the way stories took shape. They cover a breadth of topics like fertility, abortion, gender, a woman’s role in ritual and more, including the “darker stories” of substance abuse, domestic violence and poverty in the Jewish community that Lilith boldly took on when others shied away. Within the subset of these broader topics, are the original notes, the ephemera, the correspondence, the minutes and agendas from meetings and conventions, and the correspondence between readers and editors. “Lilith offers 40 years of primary source material that opens a window onto myriad aspects of the lives of Jewish women over four decades. It reaches into every area of endeavor,” said Dr. Joyce Antler, the Samuel B. 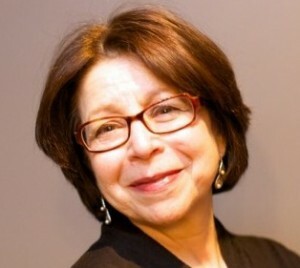 Lane Professor of American Jewish History and Culture, and Women’s, Gender, and Sexuality Studies. Schneider determined that Brandeis was the best home for these papers. “This archive does more than document the women’s movement from a Jewish perspective. For example, through these documents one can trace the emergence of the Jewish women’s foundations, notes on how women will fund women’s projects — or not. The Lilith collection opens a window on the development of the Jewish community and a whole range of gender issues from the feminist perspective,” said Schneider, also a member of HBI’s Academic Advisory Committee. For Brandeis, the Lilith archive anchors a burgeoning collection of papers and archives by important Jewish feminists including Aviva Cantor, E.M.Broner and Fanny Hurst to form a critical mass that both supports the curriculum, makes Brandeis a destination for Jewish feminist research and opens the door to future collections of Jewish feminist papers. “We have a sense of the interests of our research community and want to build on our existing strengths. The Lilith material is a wonderful trove for scholarship in the area of Jewish feminism and other subjects, and it lays a cornerstone for future collections,” said Sarah Shoemaker, Associate University Librarian for Archives &​ Special Collections in the Brandeis Library. Elaine Reuben, ’63 and a member of HBI’s board of directors, supported the acquisition of the Lilith archive with a generous donation. She did so to honor “the immense meaning and value of the Lilith papers,” to promote the notion of alumnae donating their papers to a Brandeis collection about women, and to encourage other donors to support this goal. On the subject of motherhood, the cover of the fourth issue of Lilith, back in the 1970s, featured a pregnant torso, and asked why Jewish leaders want women to be fruitful and multiply. Over the years, the magazine’s articles about childbearing and reproductive choices have focused on everything from abortion or unplanned pregnancy to fertility challenges, new and old rituals around pregnancy, Jewish women’s embrace of new reproductive technologies, and stories of Jewish women who relinquished their babies for adoption in the pre-Roe v. Wade era. “These are complicated narratives and the archives’ voluminous files on the subject attest to this,” said Schneider. Lilith also maintained a “talent bank, like expanded Rolodexes or binders of women experts” who could be quoted on various subjects, featured as speakers and cited as sources on a range of issues. “People knew to call us when they wanted to avoid panels full of men only,” Schneider said. In this day of paperless offices and constant purging, how did Lilith manage to save so much? Schneider credits another of Lilith’s founders, Aviva Cantor, whose papers are also at Brandeis, with having a historian’s sense of the importance of saving documents and ephemera of potential interest. The fact that Lilith has remained in the same office building in Manhattan for 36 years also meant nothing, such as a move, prompted a purge. Now that the Lilith’s collection is housed at Brandeis, it will become a “living archive,” with the magazine adding to the collection by sending more documents each year. “And apropos of the Lilith collection being a magnet for the papers of other feminist entities, I pledged to send my own personal papers to Brandeis,” Schneider said. Amy Sessler Powell is HBI’s Director of Communications. Susan Weidman Schneider, ’65, one of Lilith’s founding mothers, received the Alumni Achievement Award on October 24, 2015, along with Roy DeBerry ’70, MA ’78, PhD ’79, a human rights and social justice activist.